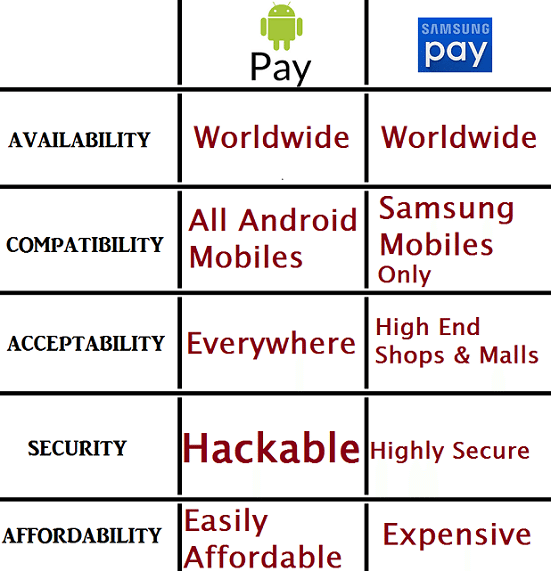 Android Pay vs Samsung Pay, An Indepth Analysis. There is a boom in the world of mobile payments options and that is good news for the consumer. It means soon; people will leave their wallets at home and pay for everything using their smartphones. The global market for mobile payments is estimated to grow from approximately $236 billion to $720 billion in transactions by end of 2017. This amazing growth, especially on Android phones,is primarily driven by two of the mobile payment options: Samsung Pay and Android Pay. Both of them arrived in the market in September 2015 and since then, they have established a firm place on the market with partnerships with retailers and countless financial institutions. Whichever of the two you are going to use it is good to know the differences just to be sure of what you are getting yourself into before you do it. One of the main differences between the two mobile payment options, is the devices that support either of the two mobile payment options. Samsung Pay is available on Samsung smartphones that have an Android version KitKat 4.4 and later. This is mostly on the Samsung Galaxy smartphones. This means if you prefer using Samsung Pay instead of Android pay, buying a Samsung smartphone is your only option. Other select Samsung mobile phones can also support Samsung Pay if their software is upgraded to a newer version. Android Pay, on the other hand, is not limited to platforms. So long as you have an Android phone, Android Pay will be supported on your phone. The only limit it has is on Apple’s devices but all the other smartphones with Android OS can support Android Pay and this is a huge difference between Samsung Pay and Android Pay. This means you can have Samsung Pay and Android Pay both on your phone if you have a Samsung smartphone and you can use the one you want at any time. Another emerging difference between the two is the number of retail locations and banks/financial institutions they work with. Samsung Pay works with more retail locations as compared to Android Pay. But it also works with a small number of banks and cards as compared to its counterpart Android Pay. At its launch, Samsung had Bank of America, U.S Bank and Citi on board as well as American Express, Master Card and Visa. When you add a card via Samsung Pay, you get the same experience between all the cards, unlike in Android Pay where you can add a card,but it’s not fully supported. With Samsung Pay, once you add the card to the app, it works flawlessly. With Android Pay, not all card types or banks are supportedand this leads to some confusion. Before you add a card to Android Pay, contact your bank first to ensure it is fully supported. Android Pay supports loyalty and gift cards where you just enter them into the Android Pay app and it displays them on your screen as a barcode to be scanned by the merchant. You can’t manually enter any number or merchant like it used to happen with Google wallet but you can only add gift cards from programs recognized by the system. Android Pay uses NFC (Near Field Communication) technology hardware that is available on Android phones. To complete a purchase, a single from the NFC hardware on compatible Android phones is used or Android Wear-based smartwatch to a retailer POS terminal. You can also use Android Pay online together with the supported apps and there are retailers who support purchasing items online via Android Pay using Google Chrome web browser. One of the other significant differences between Samsung Pay and Android Pay comes in the technology they use. As mentioned above, Android Pay uses NFC technology and so does Samsung Pay. However, the difference is in the addition of Magnetic Secure Transmission (MST) technology in Samsung Pay. This means you can use your supported phone or watch and make payments on the Point of Sale systems that use the older MST technology. This is the same technology used on debit and credit cards with their magnetic stripe on the back. This allows Samsung Pay to be used by as many retailers as possible as compared to its rival Android Pay. Samsung is also installing a magnetic coil inside some of its recent Galaxy smartphones. The field created by the coil combined with the Samsung Pay app can be used to transmit payment signals to standard credit card terminals using MST technology. All these mobile money have distinct features making them different in their own way. The choice on the service to use is dependent on the user. But if you have a Samsung device that can support both Android Pay and Samsung Pay, use them and add your cards on both to use depending on the situation you are in.